Few times in my life have left me emotionally speechless. This might be one of them. It was extra awesome because I didn’t even know this existed. When I opened the personalized card in the mail to find said aquired gem it sparkled and shined like C-3PO, and I nearly cried. Did I mention it HAS MY NAME ON IT!! I am pretty sure Cash4Gold will be emailing me any second. So what are the perks? Well, you get a free drink after 15 stars which I’m guessing equals one drink, and free refills. Also no charge on syrups and soy milk and a bunch of others. 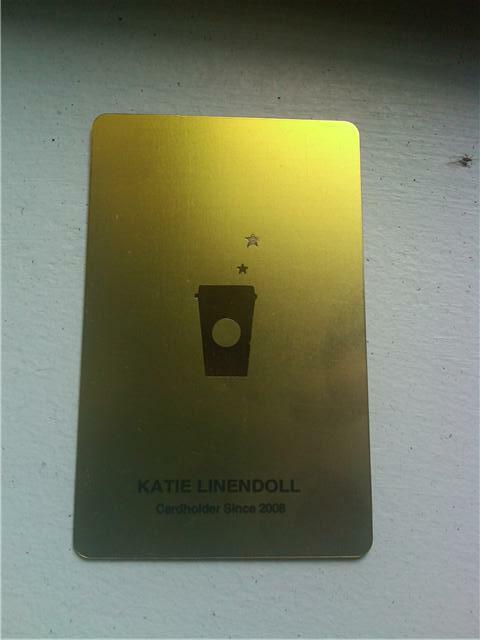 But the real big deal is I have a gold card with my name on it. Buckios iced double espresso with soy just has the keys to my heart and now I can purchase it with GOLD.